Hello bookish fiends! Today we have a super detailed guide for authors or bloggers trying to wrap their minds around this "mailing list" phenomenon! You will want to know these tricks so you don't smush yourselves into a mud puddle infested with spiky urchins. Like bb!Alyssa did 2 years ago. If you don't want to miss out on future tips, be sure to sign up here. Under our capitalist overlords, we've got to earn money for books and food! (Yes, I put books first.) 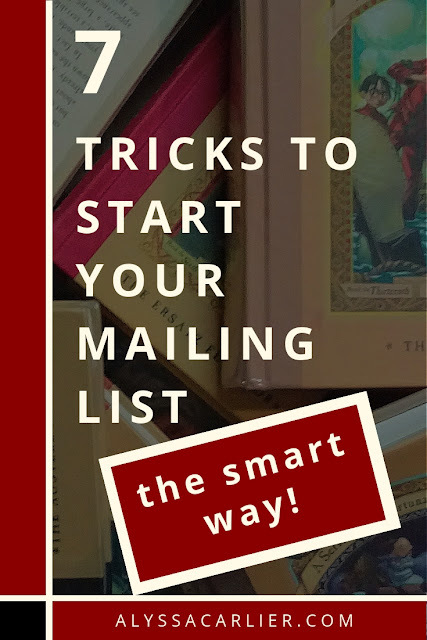 If you want to monetise your book blog or sell your own books, a mailing list is an incredibly helpful direct line of contact to the people who are interested in what you're offering. So let's get to the TRICKZ that will get you ahead of the curve. 1. Don't ask people if you should start a newsletter. Say, "I'm thinking of doing a newsletter! Sign up if you'd read it!" If you can't be bothered to set anything up, that's manageable -- just ask people to message you their email address. People vote yes on your Twitter poll, then forget about it. Action is the best way to confirm interest! This isn't a major tip, but I see y'all doing it on Twitter and it's a pet peeve. 2. Mailchimp is not the only option. Really. Fantastic, user-friendly automation — I can follow up on certain people who've clicked a certain link and go up to them like "heLLO I think you'd like a glass of lemonade"
Send rich text emails like you're just chatting with friends. WHICH I LOVE. I had deliverability issues in the three months or so that I used it. Because I'm super picky with templates, I wrote all my own emails with HTML, so if you're completely new to coding, make sure you're comfy with their templates. I did encounter some technical issues here and there but their live chat support is really excellent. Basically 83% the features I need? For free?? For more subscribers??? Another option is sendinblue, which has unlimited subscribers, but only lets you send 300 emails a day on the free plan. Explore options before leaping on the generic train, okay? Okay, teacups! 3. Don't use embedded sign-ups. Use a page on your own website. Don't embed in your blog posts. Don't use a landing page by your email provider. Don't use a third-party form. Because you might want to tweak your signup, and the changes might not translate to your embedded form. Because you might want to change providers, and now all your forms in old blog posts are wrong. Because the third-party form provider might vanish, and your links are now dead. Yes, I learned these the HARD way. If you don't know how to set up landing pages, I will teach you that in a future post (stay updated here). But for now, set up a redirect from a page on your own website to a landing page of your email provider, or embed the sign-up in a static page and send people there. When you level up and want to make changes, it will be much easier to tweak your own page! ... and yes ... I am pointing you to mailchimp's signup form for tutorial updates ... because if I changed it now, I'd have way too many dead links to fix. DO AS I SAY not as I do. 4. Reconsider using tips or tutorials to make people sign up. —uh, Alyssa, YOU ARE DOING THIS. You see, these rules are like writing rules, where if you know why they exist, you're free to break them. I'm not the boss of you. You're your own boss. Or you're an underemployed millennial who wants to dismantle capitalism?? Sign me up for THAT mailing list. Authors: The reason you shouldn't use "how-to" posts to entice people to join your list is that you're likely giving advice on how to write to other writers, when the people you actually want on your list are people who think your book idea sounds cool and will want a copy 30000 years later, when revisions are finally done. I won't lie, tutorials can create amazing sign-up numbers, but think about who are the right subscribers for your newsletter! Tutorial posts are a common suggestion for mailing list beginners, so I just wanted to say my piece against them for fiction writers building their platform. Book bloggers: Tutorial posts are an AMAZING way to connect with other bloggers and I do love to do that!! I'll shake all the hands like an octopus! But if you want your audience to be comprised of a wider audience of non-blogging readers, then you might want to think of other content ideas. 5. Don't act like a company sending me discount codes I'll never use. I personally love author newsletters because they're an intimate way to talk with my closest supporters. I say hello teacups I need your help to choose a title because I'm a silly indecisive goose. I say they say dystopian is dead, my book is going to prove them wrong. So I don't get it when author newsletters have weird block formats and speak in the third person and paste their blurb in wholesale! I mean, nothing against these authors, it's just not my style. That's up to you! 6. Don't do it just because they all say you should. Mailing lists actually can take a lot of time, and mistakes, and effort. It's definitely not "build it and they will come" or "passive income". If someone's mailing list reached 10K in 2 days, it's probably because they were already influential. Start a mailing list if you have the time wouldn't mind modest results. It's great, but I don't feel like it's a must. So if you find all this confusing, it's fine to ... not. Alyssa, of course I find this confusing! You keep telling me what NOT to do, and it's turning me into a porcupine in headlights! Tell me something TO DO. 7. Convert your social media followers to email friends. You know what? I'll be real. Social media is still going to reach more people. Emails aren't going to go viral! So find a way to turn your social media reach into an email list. Here's why — social media is owned by corporations who like algorithms. Ugh. You can't control them, or their decisions when they decide to wipe you off the map but keep the racists around. PSA. A misconception about mailing lists: A lot of people just shout "no algorithm!" six times as though this is a ritual to ward off the demons of social media. Well, first of all, there is an algorithm: email spam filters, your service providers' terms of service, and also your readers' minds. On a good day my email list may get 50%-70% open rates. My smol Instagram account's posts might be seen by 50% of my followers and it might also get seen by four times as many non-followers. Don't leap on the hype train just for the demon rituals! But you won't lose the subscribers because of a social network's say-so ... take your list with you unless they unsubscribe. does NOT work: "Want to find out 10 reasons romance is dead? get the deets here: [SIGNUP LINK]"
This is the classic "lead magnet" style that lots of other email list tutorials will suggest, to entice them with some sort of secret or benefit or incantation. My personal results are dismal. Maybe I'm doing it wrong, but I'm not doing it anymore! sometimes works: "I just started a newsletter, please join here! [SIGNUP LINK]"
This isn't fancy, but it will get your closest followers to join you. I've literally signed up because an author I liked said "I will feel bad if this doesn't work". The guilt trip annoyed me, but it worked! If nothing else, here's your takeaway from this post: a mailing list is not going to inherently net you new fans like an ad. For me, I use it to continue to engage with people who already like what I'm doing! That's why giving a blunt invitation is better than writing up clickbaity ~content upgrades~ to lure people in. best for me: "Friends, my latest newsletter drops Saturday. I'm talking about [TWO TO THREE SPECIFIC THINGS]. Join here! [SIGNUP LINK]"
maybe works?? "Hello. My name is Inigo Montoya. You killed my father. Prepare to join my murder newsletter." and that's a wrap! If you'd like to see how I do my authorly newsletters after learning from 2 years of mistakes, here's the link. ... I will feel bad if this doesn't work? Ha! Any questions about mailing lists? Comment below! Oh, and leave a link to your newsletter + join up with other people's too — there's no better way to learn about newsletters than observing how others do it! .S. My next post is about how to start a stylish book blog or author website for FREEEEEE. If you want to stay updated on that, head here. Looking to promote to book lovers? My giveaways are promoted to around 1.5K dedicated newsletter readers, may reach over 30K impressions on Twitter and a potential audience of over 50K on Instagram. Email me to sponsor one now or find out more!